I sat in the Head Start classroom reviewing policies and procedures and came across the program’s guidelines about what to do in the case of a drive-by-shooting. I gulped as I read the instructions to teachers to grab the orange whistle hanging by the door and to blow it to signal to the children to huddle together in the middle of the room, away from windows and doors. I had come to this program in Los Angeles having left Stehekin, my tiny community in Washington’s North Cascades, to be part of the team conducting a review of how well the program met Federal Head Start standards. I knew I was in unfamiliar territory the minute I got in the rental car and weaved in and out of traffic on the multi-lane freeway; in Stehekin, the maximum speed on the valley’s single paved road was 25 mph. But learning that teachers here had developed the drive-by shooting procedures after shots had been fired in the neighborhood, I felt I had traveled to another planet. That was nearly twenty years ago, four years before names like Columbine and later, Virginia Tech and Sandy Hook, began to call up images of terrified students and teachers threatened by people wielding guns in their classrooms, hallways, and on their campuses. Now, on the rural island where I work as a school nurse, a red sheet of lock-down procedures is posted on my office wall, and the administration periodically conducts drills to prepare students and staff for the possibility of an armed intruder. He reassured us that he isn’t a convicted felon, nor does he own a gun, but he made his point about a flaw in our state’s firearms sales regulations. Steve held up a stack of petitions for signatures supporting Initiative-594, a measure to change the law. I took a handful. Support for the initiative is being organized by the Washington Alliance for Gun Responsibility. As of this week, the alliance needed just 10,000 more signatures to reach the 325,000 required to get the initiative before the State legislature. If that happens and the legislature passes the initiative, it becomes law. If they don’t, it will go on the ballot for the November 2014 election. Here’s what I-594 addresses (full text is at Initiative Measure 594). 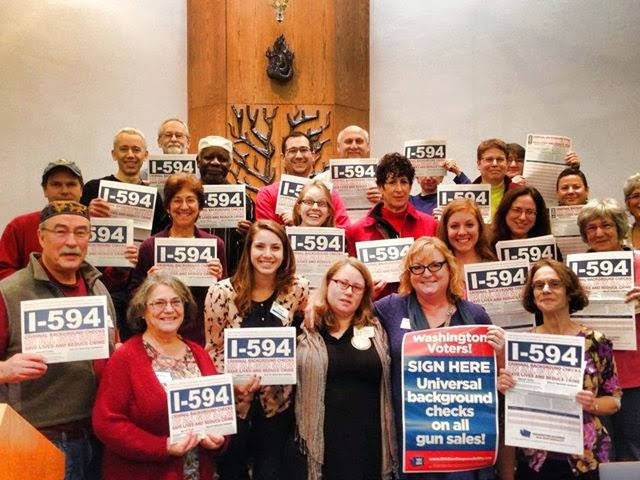 Current law requires criminal and public safety background checks before purchasing a firearm from a licensed dealer; the initiative would change the law to extend this requirement for checks to most firearm purchases and transfers in Washington, including gun show and online sales. According to the Alliance, an estimated 40% of gun transfers in the U.S. take place without going through a licensed dealer. In 2012, 6.6 million guns were sold with no background check for the buyer. I’m putting my signed petition in the mail today, and I hope that readers in Washington who haven’t yet signed will go to the website to find out how to add their names to the list. Even if this initiative passes, I know it won’t put an end to all gun violence. But perhaps it will decrease the chance that those drive-by-shooting and lockdown procedures in schools and Head Start programs will ever be needed. Right, Gretchen. Not the solution, but a step in the right direction.